I'm getting ready for the Society of Biblical Literature / American Academy of Religion meeting in Chicago later this month. Besides getting the SBL / AAR app I described in the previous post, here's another suggestion that will help. One of the fun aspects of such meetings is going around the exhibitor's hall and checking out all the new books. I won't be buying very many books, but there a lot of books I want to remember and check out later. Further, I'd love to have the books saved as some kind of online link so that I can easily obtain the bibliographic info and add notes to them. What's the best way to do this? Zotero is the obvious solution for the online database. I've written frequently about Zotero. It is wonderful. If you are not using it, why? Now the only question is how to get the books into Zotero. Further, with Zotero, when working with any word processing tool, you can quickly pull in the bibliographic data you need with drag/drop. If you use MS Word, OpenOffice, LibreOffice, or NeoOffice, use the plug-in to automate the whole process of entering footnotes and generating bibliographies with a variety of standard citation styles. 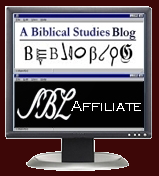 You can even install the Society of Biblical Literature stylesheet. Do note that there is another Android scanner for Zotero called Zandy. ($4) I have not tried this, but it appears to try to offer more ways of working with the Zotero entries. It may be a better choice than Scanner for Zotero, so if you've tried it, please share your experience in the comments. If you have an iPhone/Pad/Pod, there is a similar scanning app called BibUp available for free through iTunes.